1. Oil decision day: OPEC and other major crude producers are gathered in Vienna to discuss whether to extend production cuts designed to rid the world of excess oil. The curbs were first agreed a year ago by countries including Russia and are set to expire in March 2018. There are signs that the giant supply glut is starting to disappear, but an extension -- possibly to the end of 2018 -- could help cement the trend. U.S. crude futures were trading 0.4% higher at $57.50 per barrel. 2. U.S. tax progress: A final vote on the Senate tax bill is expected late Thursday or Friday. Republicans are racing to approve the measure, which survived a procedural vote on Wednesday that allows debate to begin. The House and Senate tax bills still contain major differences. It's not clear whether the competing versions of the plan can be reconciled without losing votes. 3. Bitcoin madness: The virtual currency hit a record of $11,350 on Wednesday, then nosedived more than 18% to below $9,300 after two major exchanges said they were struggling with a huge spike in traffic. By early Thursday, it had recovered to trade around $10,400. Some analysts are warnings of a Bitcoin (XBT) bubble, while others attribute the gains in recent weeks to the expectation that more major investors will soon join the rush. 4. Global market overview: U.S. stock futures were edging higher. Asian markets ended the session lower. European markets were mixed in early trading, with the FTSE 100 dropping by 0.4%. The pound gained 0.4% against the dollar amid growing expectations that the U.K. will be able to reach an agreement on its financial settlement with the EU. 5. Market recap: The Dow Jones industrial average added 0.4% to hit another record on Wednesday. The S&P 500 closed flat. 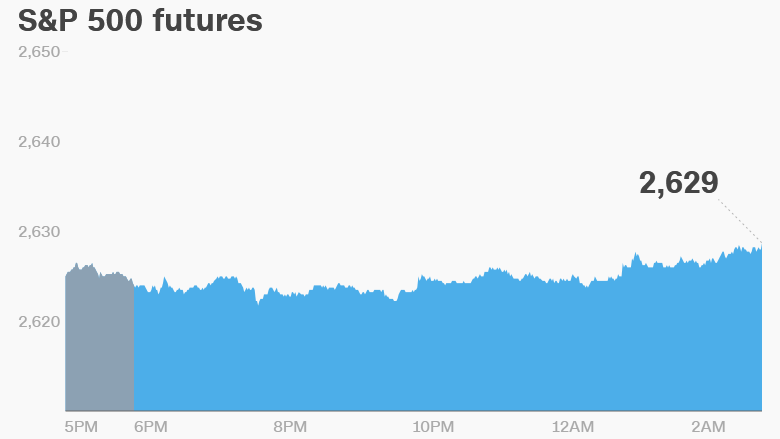 It was a different story on the Nasdaq, which suffered its worst day in three months, slumping 1.3%. 6. Earnings and economics: Barnes and Noble (BKS) and Kroger (KR) will release earnings before the open. Kroger reported sluggish sales growth and a slight drop in profits last quarter, sending its stock down on fears that it is losing the grocery stores war to Amazon (AMZN) and Walmart (WMT). The U.S. Bureau of Economic Analysis will release its personal income report for October at 8:30 a.m. ET. Manufacturing PMI came out slightly above expectations in China, a positive signal for the world's second biggest economy. India's latest GDP figures are expected at 7:00 a.m.